There are many hikes in Canyonlands National Park. In order to find the best suited hikes, it’s important to know the difference between the sections of the park. Canyonlands National Park is split by The Colorado and Green rivers and is broken into four sections. The Northern section of Canyonlands National Park is called Island in the Sky. It is closest to Moab, and thus the most popular area of the park. The southern section is split in two. The Needles is located in the Southeast and the Maze is located in the Southwest. The fourth section, Horseshoe Canyon, is located to the west and is not directly connected to the rest of Canyonlands National Park. The Maze is the most remote area. Visitors usually spend at least three days at the Maze and must be self-sufficient. The roads require high clearance, 4 wheel drive vehicles. The hikes are primitive. And there is no water. The regular National Park tourist would not visit this area. Horseshoe Canyon, may be accessed with two-wheel drive vehicles on a 30 mile, well graded dirt road. The canyon is home to significant Rock Art. It is known for the Great Gallery which displays life-sized figures with intricate designs. The hike to the Great Gallery is 7 miles and according to the Canyonlands National Park website, it takes more than 5 hours. The Needles, is named for the colorful spires of Cedar Mesa Sandstone. This area is less busy than the popular Island in the Sky, but provides many hiking options from easy to difficult. Four simple trails which range from a quarter mile to 2.4 miles are Roadside Ruin, Cave Spring, Pothole Point and Slick Rock Trail. 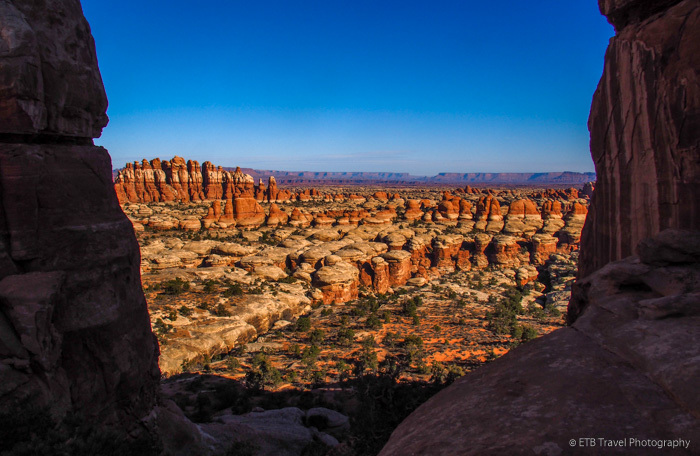 One of the most sought-after hikes in Canyonlands National Park is Chesler Park Loop in the Needles area. The 11-mile lollipop loop connects multiple trails together and may be hiked in either direction. Hikers begin the trek at Elephant Hill Trailhead after driving a harrowing 4-wheel drive road that requires a permit. To avoid the rough road, add on a few hiking miles and begin from Squaw flat. The trail immediately climbs stairs and rocks to a plateau with views of the surrounding area. The trail continues weaving up, down and around rock formations along slick rock and sandy path. Cairns mark the way. If a cairn isn’t in view after five steps, look the other way! Hiking counter clockwise, the route drops into a cactus peppered meadow and provides a break from scrambling. It is only a matter of time before the trail climbs up over more rocks and squeezes between boulders. Be sure to stop at the marked “Viewpoint” to take in the magnificent scenery. Colorful spires circle the area. To get the gist of the Needles is a good place to turn around for a shorter hike. Continuing further, hikers drop down to a dirt road also used by 4×4 vehicles. The road leads to the Joint Trail which draws many visitors to this loop. The path narrowly passes through a collection of boulders and requires climbing up a notched log. Just after exiting the Joint, hikers may detour to another viewpoint or continue down the path which drops into another meadow. Soon the trail turns to the left to complete the loop and hikers return to the trailhead via the stem of the lollipop. The trail is strenuous and takes five to seven hours to complete. Be sure to carry plenty of water on a hot day. Also, though well marked, there are many criss-crossing trails, so bringing the park brochure map is helpful. Island in the Sky also offers a variety of hikes in Canyonlands National Park. Most of the hikes in this area of the park are either very short, very long or boring according to the Ranger at the Needles desk. He suggested combining several short trails for a six-mile day. Otherwise the Syncline Loop (including the summit) or a portion of Lathrop Canyon are excellent 10+ mile journeys. Tired from yesterday’s Chesler Park Loop Adventure, I reluctantly opted for his first suggestion. I normally don’t like extremely commercialized trails. These trails, though short with some man-made improvements, mostly follow slick rock marked with cairns. The trail to Mesa Arch is a half-mile loop marked with some vegetation interpretive signs. The natural stone arch frames amazing views sandstone towers. This is a popular spot. Visit early! From Mesa Arch, follow the road to the right to reach Whale Rock. The one-mile trail to Whale Rock isn’t terribly exciting it reaches the base of whale rock. Here, it climbs the GIANT rock. The path terminates at the rock’s crest which requires a short, but fun scramble. Views of Island in the Sky abound from this viewpoint. Upheaval Dome is located just down the road from Whale Rock. Two overlook trails and the Syncline Loop both begin here. Though well marked, don’t get confused. There are more rescues on the Syncline Loop than any place in the park! The Upheaval Dome Overlook Trails are an easier choice! It is one mile to the first overlook which provides excellent views into the two-mile crater. It is thought that a meteorite created the fracture, but some questions remain. To reach the second overlook, hikers must follow cairns across slick rock and descend down rocks and stairs. The second overlook provides a better camera angle for shooting the grey mounds in the center of the crater. The roundtrip is 1.8 miles. Grand View Point Overlook is on a different fork in the road. From Mesa Arch turn left. Or upon returning from Upheaval Dome, turn right at the intersection. I LOVED this viewpoint and would save the best for last! The overlook yields spectacular views of the La Sal Mountains, the Abajo Mountain, the Needles, Monument Basin and Colorado River Canyon. I particularly liked the white rim sandstone that defined the lower level canyons. A two-mile trail travels along the edge of the overlook. It looks like it just provides different angled views of Monument Basin, which it does. Don’t be fooled! It crosses the plateau for a magnificent site of rainbow cliffs and towers. It was like looking through a kaleidoscope! The variety in landscapes is what I like best about the hikes in Canyonlands’ Island in the Sky. While these are not all the hikes in Canyonlands National Park, I have highlighted many of the most interesting choices for the average tourist.